Wowza. This week has been a whirlwind. I’m finally settling down and giving myself a tiny bit of downtime today. The last week and a half or so left me feeling completed drained and exhausted all the time. The fact that it took me so long to figure out why proves how much I need to build downtime into my schedule: I haven’t been eating well! I know way too well that how I feel is directly tied to how well I’m eating. More times than I can count in the last two weeks I’ve eaten cereal for dinner which is a terrible idea because there is little nutritional benefit and I’ve been burning and extra 500+ calories a day so eating cereal isn’t going to help me replenish those calories and prepare for my next workout. Why haven’t I been eating actual food? I’ve been scheduled from early morning (sometimes 5:45 am) until bedtime more days than not so I haven’t been able to go grocery shopping and, if I did, when was I going to cook? I will be the first to say this is a bad answer. Food is important, making time to eat and prepare good food has long been a high priority for me…but somehow the last couple weeks have gotten away from me. By the time I get home at 8:00ish from a spinning class I’m super hungry and super tired so cereal is easy and doesn’t require clean-up. As soon as I figured out yesterday that I couldn’t remember the last time I actually made a meal for myself, I decided that the other things on my to-do list were less important…and decided I wanted paella. Why? I have no idea. 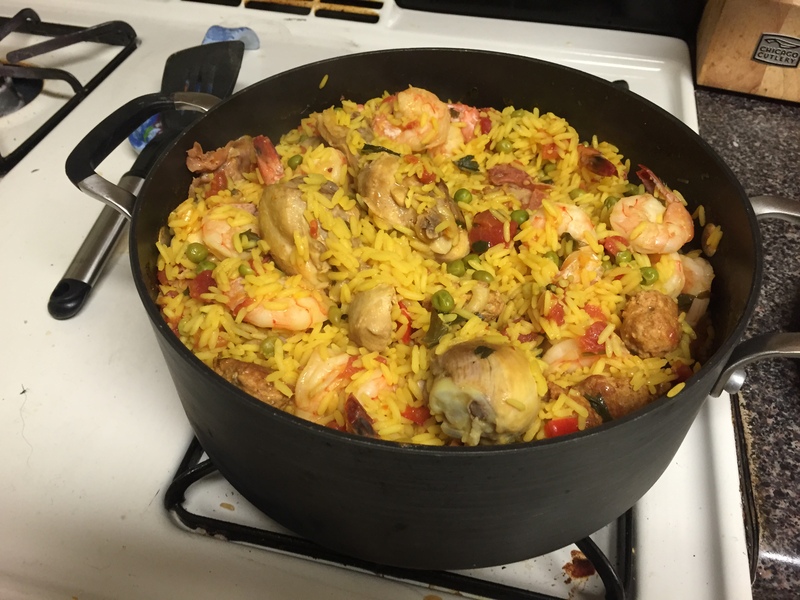 I have made paella one time, I think, and it was in high school. But that’s what I wanted and if it was going to get me to eat a meal, I was willing to do it. I found this recipe which looked simple enough (note: paella is never simple but simple enough). You may notice something about this recipe…it includes meat. I haven’t cooked with meat in quite awhile. I wrote about my decision to stop cooking meat last July and yesterday was the first time I’ve bought meat since then (except bacon one time…but bacon was intentionally put into a category all of its own). Though I haven’t written about seafood, I’m also trying not to eat much of that either as trying to figure out how to determine if seafood is sustainable is more complicated that trying to understand astrophysics. So yesterday was a big day: I bought chicken, shrimp, prosciutto, and chorizo (though I used chicken chorizo…which I don’t know is really a thing but that’s what they were called). So new goal: go back to meal planning! I was so good at that for months, time to get back. Coming up soon: review of Past Tense Yoga, Pure Barre Bethesda, Balance Studio and Class Pass (some of those may be combined)!